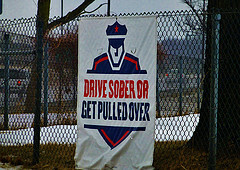 The national Drive Sober or Get Pulled Over campaign will result in the arrest of anyone caught driving drunk. Understand that police will have zero tolerance for impaired motorists, and will not accept any excuses for being impaired behind the wheel. A shocking 10,322 people were killed in drunk-driving crashes in the United States in 2012. Over the course of Labor Day weekend in that same year, 147 lost their lives due to a drunk driver, more than a third, or 38 percent, of all traffic fatalities that weekend. Of all the reported collisions that weekend, one in four were attributed to drivers with a BAC level of .15 percent or higher, which is almost twice the legal limit of .08 in all 50 states and the District of Columbia. Someone is killed in a DUI-related auto accident every 51 minutes across the United States. Over the Labor Day weekend, the rate of fatalities jumps up to one every 34 minutes. The evening hours are even more dangerous; almost half, or 46 percent, of deaths occurring over Labor Day weekend happened at night in comparison with day time DUI fatalities accounting for 25 percent. The Florida DUI Lawyers at Whittel & Melton want to remind all drivers to plan ahead and always designate a sober driver before heading out to a bar or attending any events where alcohol will be served. Planning a sober ride home, whether it is a taxi, public transportation or even a friend is the best choice. This Labor Day weekend should be about fun, so don’t let the festivities turn into fatalities. We urge you to remember that aside from the obvious risks of killing yourself or someone else, driving drunk or under the influence of drugs can also lead to serious criminal consequences. A DUI arrest can mean time behind bars, the loss of your license, and hefty financial expenses; on average, a DUI can cost up to $10,000. If you or a loved one has been arrested for or charged with a DUI anywhere in the state of Florida, please call a Florida DUI Defense Lawyer at Whittel & Melton statewide and toll-free at 866-608-5529 or contact us online for a free initial consultation. We can make sure your arrest was lawful and help you understand all of your defense options.